PE Coated. 350mm glass rack. for 12 pint glasses. 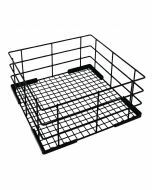 Our Wire High Sided Glass Baskets are a durable high-sided warewashing rack suitable for glasses, cups and other open containers, holding them all in one easy to lift and transport basket. Holding up to 12 glasses and coated in PE, this dish basket is durable and practical, perfect for busy kitchens.